Delicious, thick and creamy tasting Müllerlight Greek Style yogurt has won a top consumer choice award less than a year after launch… And it’s not a myth! Scooping the title of Product of the Year for 2013 in the Healthy Yogurt Category marks another milestone for the brand which has already clocked up sales on over 61 million pots in just 42 weeks. 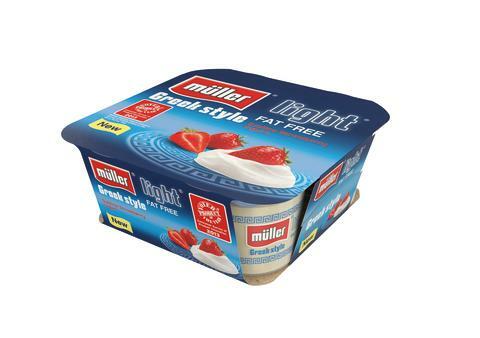 Launched in March 2012 – the biggest launch in the category in the past two years - Müllerlight Greek Style has captured a 1.9% share of the total yogurt category with a retail sales value of over £23 million. Michael Inpong, Marketing Director at Müller Dairy UK commented: “The combination of indulgent flavours in a fat free treat make Müllerlight Greek Style a favourite with the nation’s consumers and this award is testament to that. Product of the Year is the world’s largest consumer-voted award for product innovation and serves as a guide for consumers to the best products in their market and rewards manufacturers for quality and innovation. In the UK, the Product of the Year seal is backed by the votes of more than 10,000 households, serving as a shortcut for shoppers in the supermarket. Müllerlight Greek Style fat free yogurt is available in 5 tantalising flavours; Luscious Lemon, Coconut with a hint of Vanilla, Honeyed Peach, Morello Cherry, and now Sublime Strawberry. Packaged in 4 x 120g pots, each pot contains 90 calories or less, with an RRP of £2.19 per pack. The Müller UK & Ireland Group is wholly owned by the Unternehmensgruppe Theo Müller. It has 21 sites nationwide and employs around 6,000 people across 3 businesses, Muller Dairy, Muller Wiseman Dairies and Muller Minsterley. Müller Dairy is based in Market Drayton and is the UK’s leading yogurt manufacturer, with major brands such as Müller Corner, Mullerlight and Müller Rice. Müller Wiseman Dairies processes and delivers almost a third of the fresh milk consumed in Britain every day and is famous for its black & white cow-print branding. The most recent addition to the Group is Müller Minsterley, the chilled desserts facility near Shrewsbury at which the Cadbury chilled desserts, including Cadbury Mousse, Trifle and twin-pot products, are made, which Müller sells under an exclusive licence from Cadbury.